Friday night fireworks kick off the start of the 2010 La Feria de las Flores. 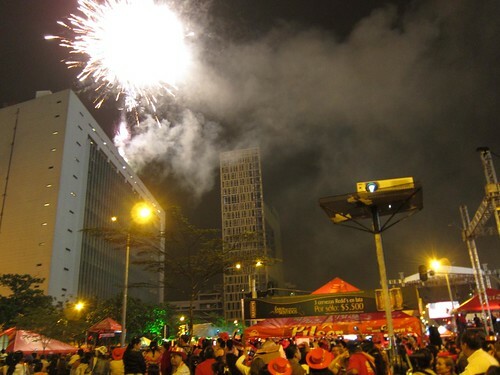 A little after 9 pm on the last Friday night of July, multi-colored fireworks began exploding over downtown Medellin. The streets below, closed to vehicular traffic, were packed with partying Paisas ready to enjoy the first weekend of the city's 2010 Feria de las Flores (Festival of Flowers). Troy, a long time contributor here at Go Backpacking, and I were in the thick of this first of many street parties and parades scheduled to celebrate Antioquean culture. According to Wikipedia, the first Festival of Flowers took place May 1, 1957. Since that first flower parade, the festival has expanded into a week long series of events so numerous they can easily leave a visitor's head spinning. One of the many women riding horses in La Cabalgata. The following day (after a late night out, and a lot of rum), I met up with Lily, a Colombian friend, and some others to attend La Cabalgata. Even though we only caught the tail end of the 6,000-horse parade, it was still my favorite event of the entire 10-day festival. I'd heard it was possible for anyone to rent a horse, and thereby participate. Given the amount of alcohol being consumed, and general rowdiness of the crowds and riders, you'd better know how to control a horse before you pony up the pesos to hop on the saddle. Speaking of alcohol, I was also informed that there was suppose to be a ban on drinking while riding the horses this year, given the trouble it can cause. Despite plenty of police on horseback, there was no evidence of riders being restricted from openly passing bottles of rum and Aguardiente around. Alongside the parade route, families, friends, and vendors had set up tents from which to enjoy the action, and make a few extra bucks. The scope of the event was far bigger than I imagined, and I quietly vowed to be around in 2011 to experience La Cabalgata more fully. During the week, there were plenty of open-air concerts and activities occurring throughout the city, however I preferred to focus on the bigger events the following weekend. The one exception was the orchid exhibition that was held in Medellin's botanical gardens. I was there with Christine of Almost Fearless, and husband Drew, as they garnered additional footage for their documentary, plus Troy and Ana (a new contributor for Medellin Living). A producer for a regional television channel noticed Drew's video camera, and a discussion ensued. The result? We were interviewed on live television within minutes, with Ana helping to translate for us! 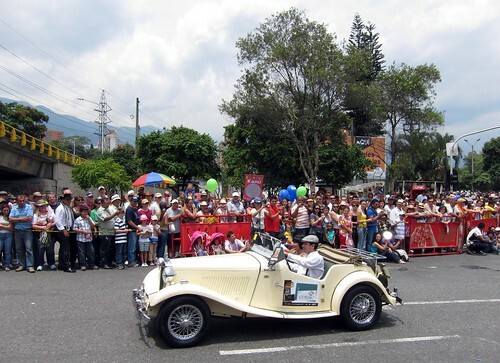 The second Saturday of the Flower Festival, I attended the antique car parade. A greasemonkey I am not, however who can argue with enjoying a few cold beers under a warm, early-afternoon sun? This parade was much more family friendly in comparison to La Cabalgata, and there were plenty of kids hoisted on their parent's shoulders to get a good view. An antique car rolls down Avenida Las Vegas in El Poblado. The cars and trucks were driven, mostly by their proud owners, in roughly the order from newest to oldest. Everyone in the cars dressed up in the style of the period from which it was manufactured. In addition to normal vehicles, there were also a range of others, such as old police cars, fire trucks, and army vehicles. Sixties muscle cars were well-represented, such as Mustangs, as were the very old, antique cars. 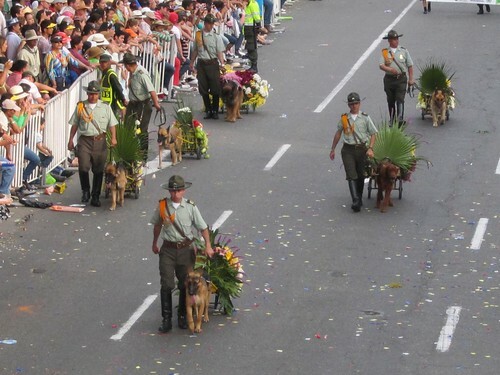 The people carrying the flower displays (silletas) are called silleteros. La Feria de las Flores ended with none other than the flower parade on a partly sunny Sunday afternoon. 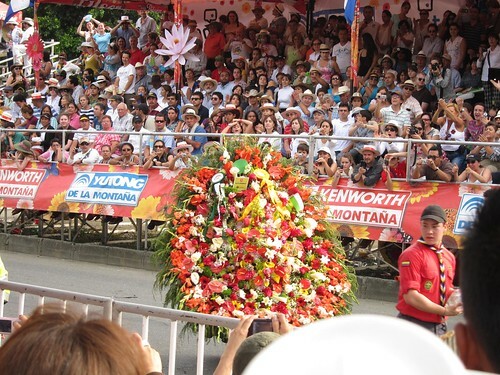 The fresh flower displays are all handmade in Santa Elena, a small pueblo outside Medellin, the day before the parade. Corporations can even buy advertising, in the form of a flower display, to be carried in the parade. 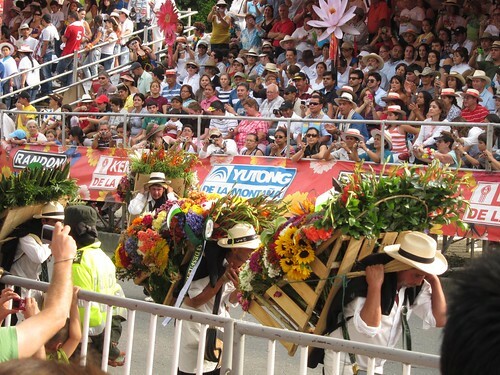 All of the flowers, which are mounted on wooden frames, are carried on the backs of men and women from around Santa Elena. The ideal way to view and photograph the parade would be from the bleachers set up along the route, however where's the fun in making life easy? Instead, Troy, Drew, and I ended up ducking under a makeshift fence and walking fast and furiously along the parade route to try and find an opening in the crowd of onlookers. This approach didn't fare too well, and judging by the people perched in trees, more aggressive tactics were required. The silletas for the parade are handmade in the nearby town of Santa Elena. As we continued to move down a street that paralleled the parade, we bumped into Robert Rose (of Punk Outlaw), another American recording parade footage for a video project. He joined our roving gang in search of a clear vantage point. Even the dogs got into the act, pulling little wheeled carts with miniature silettas. Eventually, after nearing the end of the parade route, and backtracking to reunite with Christine and baby, someone noticed a TV crew taping the parade from above an unfinished bridge extension. The liberal use of a popular media outlet's name later, and we too had access to the bridge. Perched above the street and crowds, we had unfettered views of the parade's final 30 minutes, with the red brick apartment buildings and green mountains of Medellin providing a picturesque backdrop. 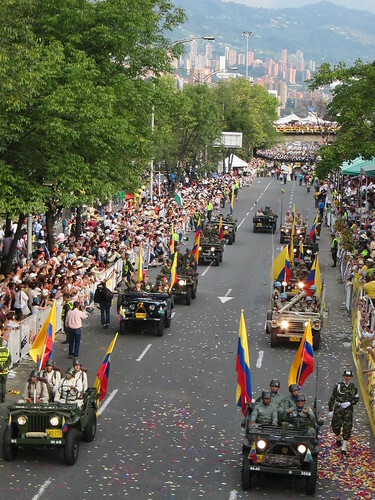 Towards the end of the parade, the Colombian army was represented. 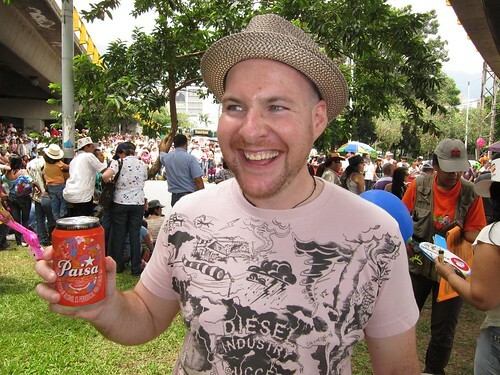 In 2009, I traveled to Barranquilla to attend Colombia's biggest Carnaval celebration. While it's fun to spray strangers with specially formulated shaving cream, the street party is limited to one weekend. I was pleasantly surprised to find the annual Feria de las Flores in Medellin offers the same festive (and highly intoxicating) atmosphere over 10 days as you'd get in Barranquilla over 3-4 days, plus the variety of parades keeps it interesting. Note: If you plan to attend Medellin's annual Feria de las Flores, book your accommodation early, and expect to pay especially high (possibly double the normal) rates. Also, beware of pickpockets as they operate best in large crowds such as those that gather for the parades. shoot me an email, will go for a beer sometime! Looks like SO much fun, love the pics! from western Africa, I imagine it’d be a ridiculous amount!